Today we announce the 20th (YES, 20th!) Wiki Wednesday! We never had articles in that many languages participating in Wiki Wednesday before, so this is great! Kombinasi pena, sensor, kontrol, dan gerakan adalah permulaan sebuah karya aplikasi menggambar. Ein Post ist ein Beitrag zu einem Thread in den Diskussionsforen. Jeder Scratcher, egal ob er ein neuer Scratcher oder schon ein richtiger Scratcher ist, kann einen Post erstellen und dann veröffentlichen (posten). Learn how to make a simple platformer in this Wiki tutorial. Nederlands (Dutch): Hoe maak je een tweetalig project? In dit artikel lees je hoe je in een project zelf een taalkeuzeknop kunt maken waarmee je voor Engels of Nederlands kunt kiezen. For the first time, we'd also like to present two articles from Wikis, which are currently in a testing state. That means they are fairly new and in the process of building up a community and writing articles. 스크래치(Scratch)는 매사추세츠 공과 대학 (MIT)의 평생 유치원 그룹이 개발한 무료 교육용 프로그래밍 언어로, 등록된 스크래처가 1800만 명 이상이며 웹 사이트에 공유된 프로젝트가 2200만 개에 이른다. הבלוק זוז () צעדים הוא בלוק תנועה ובלוק ערימה. הבלוק מזיז את הדמות קדימה בכיוון שהיא פונה אליו ובמספר הצעדים הרשום. צעד שווה לפיקסל אחד באורכו. ערך ברירת המחדל בבלוק הוא 10, אבל אפשר לשנות אותו לכל מספר. הבלוק בעצם משתמש בטרינוגומטריה כדי למצוא את הכיוון שאליו צריך להתקדם. On the last Wednesday of every month, we will highlight the Scratch Wiki and a few chosen articles in different languages. What is the Scratch Wiki? The Scratch Wiki is a collaboratively-written wiki available for free that provides information about the Scratch programming language and its website, history, and phenomena surrounding it. The wiki is supported by the Scratch Team, but is primarily written by Scratchers. The Scratch Wiki is a popular source of information for scripts and tutorials, and it continues to grow as Scratchers use it as their primary source of information. This could also include advanced articles for Scratchers around the world to build, share, and see. Thanks to Yummygum on iconfinder.com for the nice flag icons! First! It's awesome that we have the Test wikis in this too! Also, 20th Wiki Wednesday?! How cool is that? The next upcoming Wiki Wednesday will be on May 29th, 2019. If you have read a Wiki article that really helped you, go ahead and suggest it! Keep in mind what a Wiki Wednesday article should include. A few days before Wiki Wednesday, all suggestions will be taken into consideration and one will be submitted to the Scratch Team for review. Don't worry, we look at each suggestion equally - no article is favored over another. I like the idea of having differnt languages published on scratch . יאי! סוף סוף יש עברית! hi! I'm yzyzyz, the owner of the #bring_it_back studio, a sticky, 400+ projects and 500+ posts. I am an active scratcher. ad:Urgently need a popular animation? If you do, check out Every Time I Share A Project, by Randomness-TV! 20th Wiki Wednesday?! How cool is that? That is, like, super cool! The new Wiki Wednesday is out! 1: Why there isn't any posts/Wiki Wednesday things in Spanish? There's a lot of scratch users that speak that language! A profile where you can find cool projects! There is one, but it's small and sort of inactive. with the following in your original Wiki Wednesday post, so that everybody can enjoy the beauty of the Korean and Hebrew pictures and sentences? 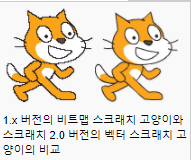 스크래치(Scratch)는 매사추세츠 공과 대학 (MIT)의 평생 유치원 그룹이 개발한 무료 교육용 프로그래밍 언어로, 등록된 스크래처가 1800만 명 이상이며 웹 사이트에 공유된 프로젝트가 2200만 개에 이른다. 현재 버전인 2.0은 여기에서 다운로드 하거나 여기에 있는 온라인 에디터에서 접속할 수 있다(이전 버전인 1.4는 여기에서 다운로드 받을 수 있다). 만 8세에서 만 16세 사이의 아이들을 대상으로 하며 고등학교 3학년까지 권장한다. join or create a Scratch-Wiki in your own language! I am wondering how you make a hyperlink.can you help?